It's Christmas! Share the joy of flying, with us! 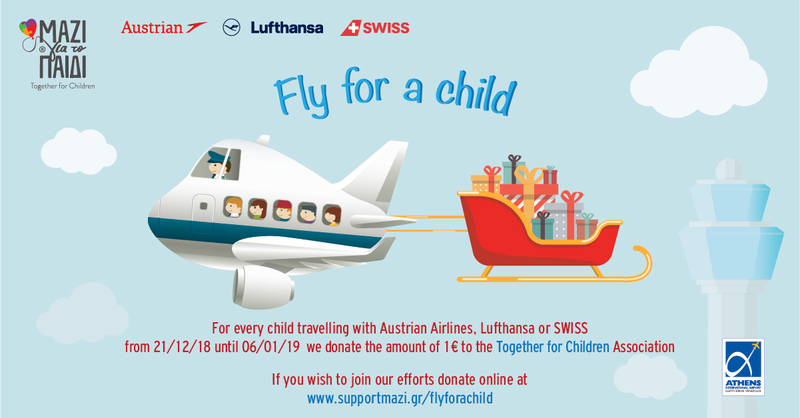 This Christmas period Austrian Airlines, Lufthansa, Swiss and the Athens International Airport, support the needs of the "Together for Children" Association! To make an online donation, in order to help children in remote areas of Greece to "travel" through books! Specifically, the money you will help us raise will provide to our young friends, the opportunity to travel through books and technology all over the world as we plan to create a small School Library in the Karateodorion Primary School of Orestiada ! This historic school, in which the great Greek mathematician Constantinos Karatheodoris has studied, operates in the village of Vissa at Orestiada, one of the most mountainous and remote eastern ends of Greece. The school helps 65 students from the surrounding villages to develop their full potential and expand their skills and education. Together for Children calls upon your help to create and equip a modern study area within the school and give these children access to a wider pool of knowledge through books and technology. The implementation of the project will take place in April 2019 as part of the "Together for Children" Campaign for Health and Education in Thrace, as a part of the Association's interventions in remote areas of Greece. A few words about "Together for Children"
Founded in 1996, in Greece, “Together for Children” is the only non-profit / non-governmental Association of NGOs in Greece, that work in the field of child welfare. With the aim to offer every form of assistance to children and young people irrespective of race, religion and political conviction, the Association helps more than 30.000 children, on an annual basis, including more than 10.000 direct children beneficiaries, who face poverty and social exclusion, domestic violence, chronic diseases, mental or physical disabilities and the sickness or death of an immediate family member. “Together for Children” is an accountable organization, committed to transparency, responsiveness to stakeholders and focused on delivering impact.